With kids there is no sleeping in. So we were up at our normal 7 am time and went ahead and fed the kids in the room while Chris loaded up the car. After that we headed down to the cafeteria for Chris and I to grab some breakfast. 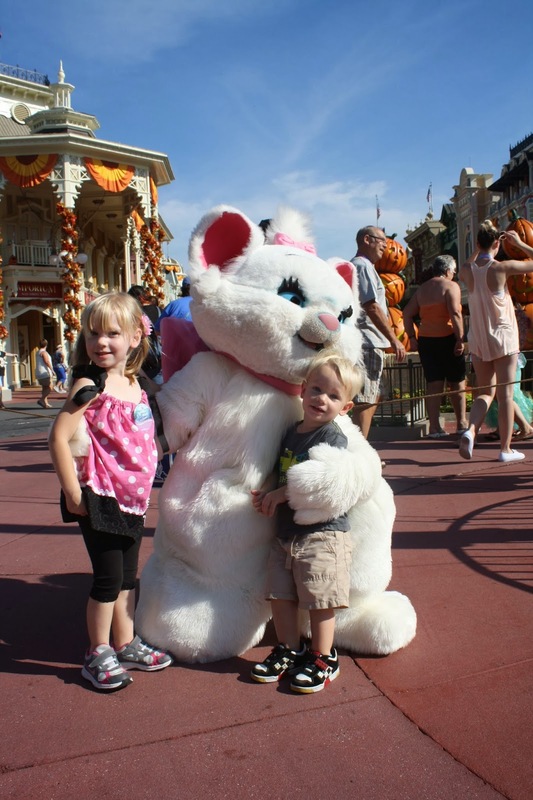 Sarah earned her ears last summer when she went to Disney for 3 days with my mom, Cami, and me. She wanted nothing to do with them last year, but this time she was happy to wear them around the resort. Of course, by the time we got to the park she was done with them. Oh well, maybe next time. We got ears it's time for cheers! 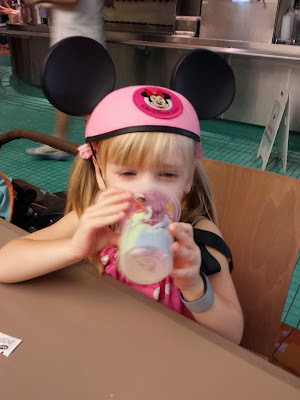 There was some talk of trying to do both the Magic Kingdom and Animal Kingdom, but with only one day we quickly abandoned the plan and just stayed in the Magic Kingdom. There is so much to do there I could seriously spend 2 or 3 days in that park alone. 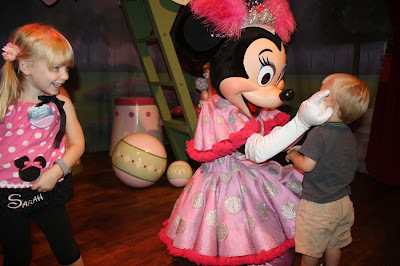 I have a bit of a bad reputation for being a go-go-go, run-run-run, person when I get to Disney. I zig and zag through crowds and am often the assigned runner to go get the next batch of fast passes. I have a plan and a mission for what I want to accomplish and what we will do. This time, on the drive down I promised Chris that I wouldn't do that. 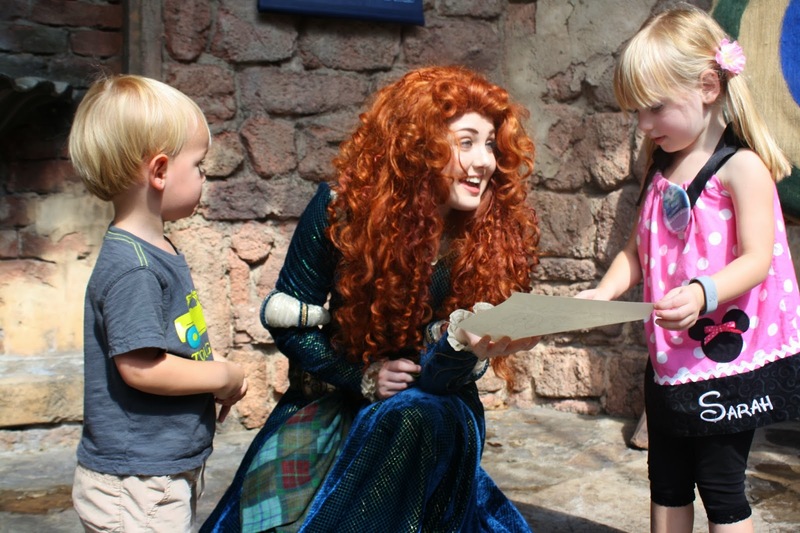 That I would meander as slow as I could, not worry about maximizing fast pass usage, and let the kids dictate what we did and didn't do. I'm proud to say that I think I kept with that. You'll have to ask Chris though to know for sure. 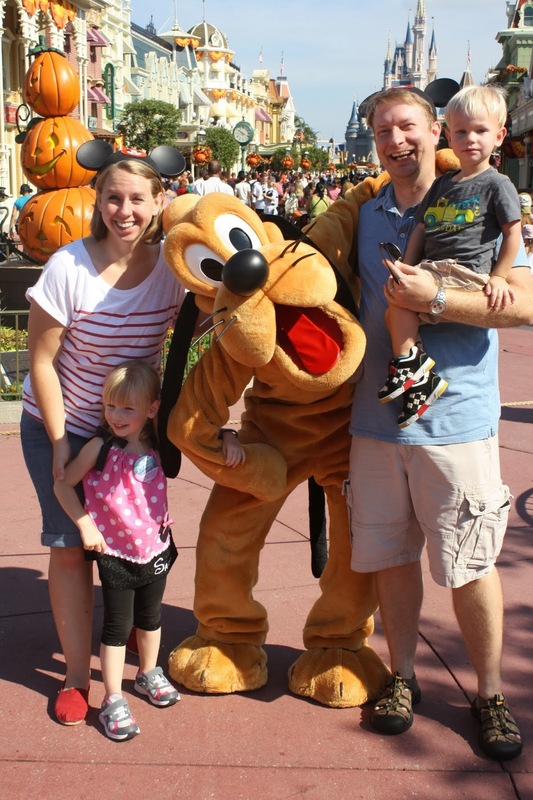 But as proof that I relaxed and moved slow we actually spent over an hour in the main square when we first walked in the park and even looked at all the window displays I've never noticed because at Disney, "ain't nobody got time for that!". The park was decorated for fall and so cute! 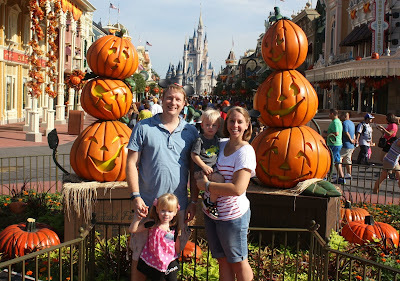 We made sure to get our castle picture with the pumpkin topiaries. I've never seen the park in the fall. It's no Christmas mind you, but it was a very nice surprise and Chris really loved it. While we were getting our family picture taken they brought out some characters and it was time for the moment of truth with Cody. I wasn't quite sure how he would react to characters. For a small kid, I get how they can be a little scary. 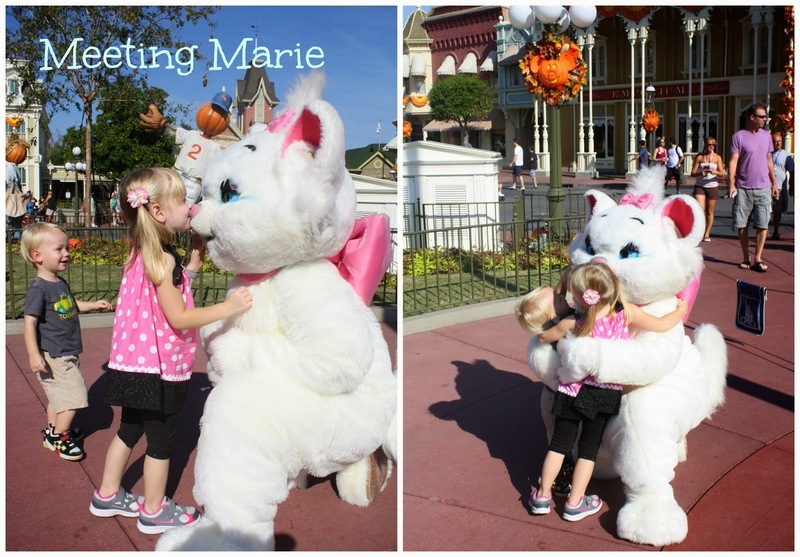 So out walks Marie from the Aristocats. Cody's never seen the movie. And as she's walking she's about 10 ft from him. Prime opportunity for screaming and cowering. Instead he yells, "Kitty! Pet kitty!" And there we have our answer, Cody is going to LOVE his first trip to Disney world. We hop in line to meet Marie and Cody is just boiling over with excitement. "Meet Kitty!" "Pet Kitty!" "My turn!" When it is our turn he and Sarah both take off running and give kitty tons of love. Big hugs for a character he's never heard of or seen before. Marie was giving Cody a kitty kiss. As we walked around to get in Pluto's line the fire "truck" driver had just parked and was nice enough to let our kids climb on it, pretend to drive it, and honk the horn. He even offered to take another group shot for us. As we waited to meet Pluto I thought Cody was going to explode. He was really excited to meet Pluto. 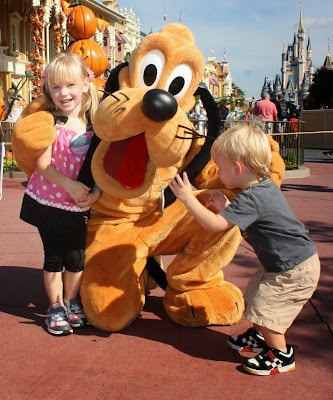 And kept yelling, "Pluto! 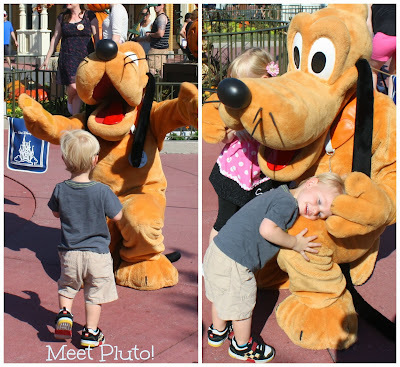 Meet Pluto! My TURN!" By the time we were next in line he was having to be restrained for fear of running off and photobombing the family in front of us. He was stomping his feet and nearing a melt down as we kept saying in a sing song voice, "alllll-mooooost". When the previous family was finished he shot out of my arms towards Pluto. 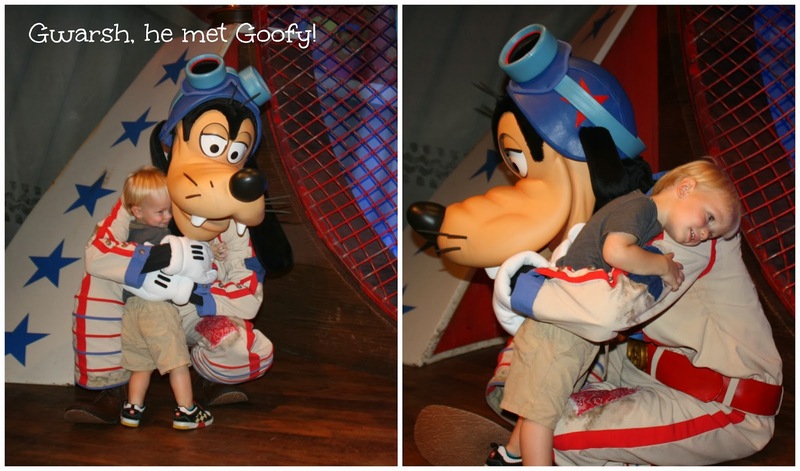 This picture on the right is one of my absolute favorites from this trip. This is a great picture of Sarah. She's so happy. I showed it to Cody to ask him what he was doing. He said, "say hi Pluto!" So I guess he was still waving at him. The only dog I wouldn't mind owning. Before we left the front we had to visit Le Chapeaux to get Cody his ears. He finally earned them. Whether he wanted to wear them or not it didn't matter. I have all our ear hats displayed above the mirror in our bedroom so I needed his pair to put up there. In theory the kids get to "choose" which pair they want. But Cody was more drawn to the baseball caps so I picked for him. But even if he was picking a pair of ears I would have picked for him. I'm a traditionalist, there will be none of those silly character ears. You get black, blue, or pink with your name on the back. That's it! That's all I'm putting above my mirror. Sorry kids. You can buy the other stupid ones with your own money on other trips. 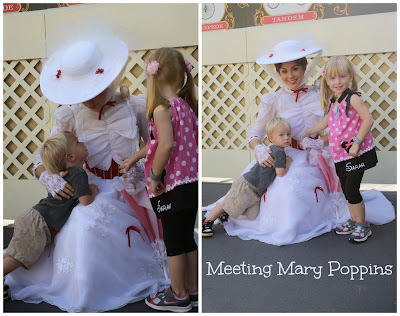 While we were waiting on the hat to get embroidered I saw Mary only had one person in line. I asked the handler if she was about to leave and when they said no I called for the kids to come over. Cody was in love. He immediately leaned all over her and just stared lovingly at her while she talked in her British accent at him. Sarah has met Mary Poppins once before but still had a great time chatting with her. I'm always so impressed with how great the characters are talking to the kids. Like I previously mentioned we strolled down main street after that and watched a bit of the show going on in front of the castle. Then as we headed off towards the new Circus themed part of fantasy land we saw the meet Merida spot with a relatively short line and hopped in it. This is one of the better thought out character ques. Like other character spots they only let a handful of people into the next cue area at a time. But in this area they have activities for the kids to do while they wait. 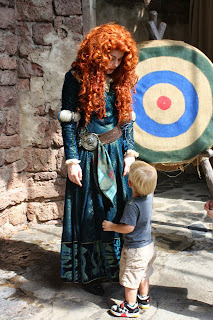 They could shoot a bow and arrow or color pictures of Merida. Both kept the kids entertained while I waited in line. It was great. 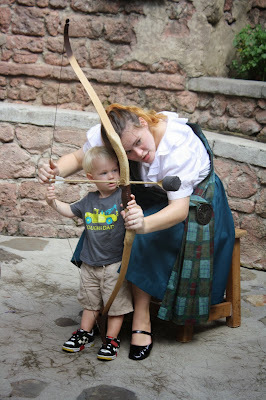 Cody shot a bullseye with Merida's bow and arrow. Sarah didn't shoot the bow and arrow. She was too enthused about coloring. I think she colored about 5 or 6 pictures. Sarah showing Merida one of the pictures she colored of her. 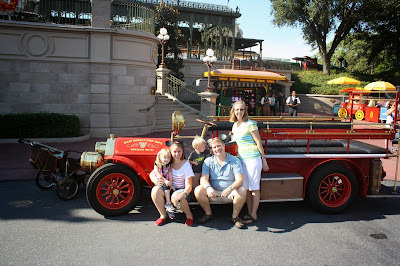 Then we finally rode our first ride. 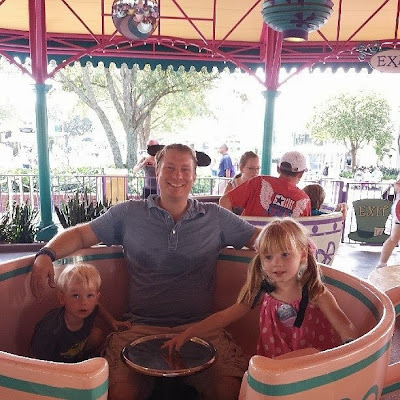 There was no wait for the teacups and I haven't ridden that thing since I was a kid. We asked Sarah and Cody and they were both excited to ride the teacups. We let Sarah and Cody try to turn the wheel and I help a little but we definitely didn't go crazy wild spinning. I didn't want to start the morning sick. 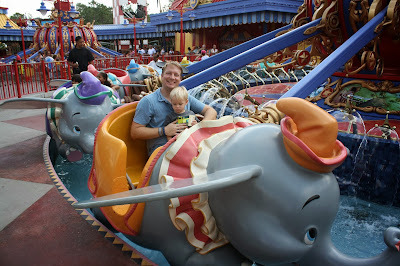 After that it was time for the classic Dumbo ride, which also had an under 10 minute wait. As we got in line the host at the front gave the kids some Dumbo Drivers Licenses for them to keep. I'll in theory slide those in their memory books. ha ha. 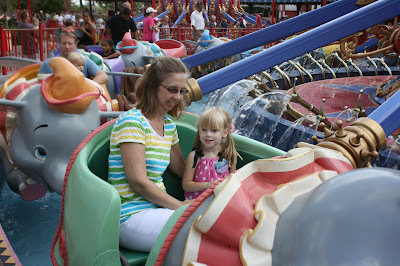 I've ridden Dumbo and the other similar rides every time we've gone with Sarah. But I usually wind up sitting next to one of the other adults on the trip. And it's just eh, I rode Dumbo, so what. This time though, riding it with Cody and his sheer enthusiam over the ride made me super excited to be on it. He was having the time of his life and it was infectious! I left Disney World this time convinced that Dumbo, and all similar rides are the best rides ever. Then Sarah, Chris, and Aunt Sarah were supposed to ride the Barnstormer kiddie coaster. Cody was just a little too short and try as I might they wouldn't let him on. So he and I went over to the big tent since to enjoy some air conditioning. 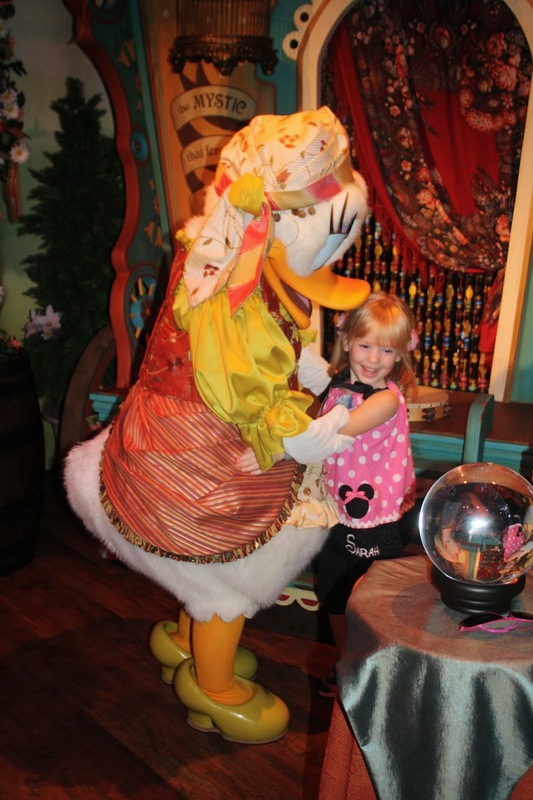 The line was short (15 minutes it claimed) to meet Goofy and Donald so we hopped in it. 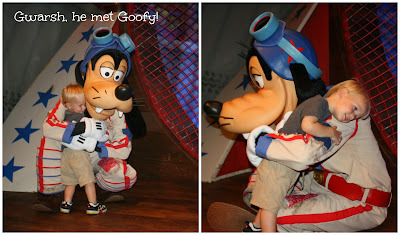 In Goofy's greeting area is a motorbike crashed into the wall. He's supposed to be a stunt driver I guess. He showed it to Cody and Cody was very cute, "Goofy broke it! Goofy broke bike!" He even tried to tell Chris about it but having no reference to what Cody was talking about I had to explain. I think Donald is supposed to be a fortune teller. 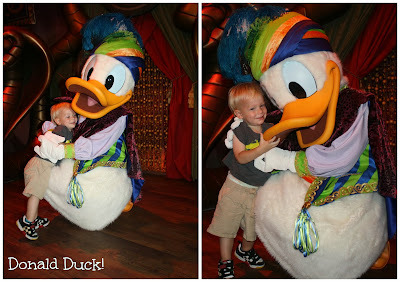 Cody was very excited to meet Donald and again almost broke out of my arms. The handler and I chatted briefly about Cody's dying need to photobomb other people pictures. 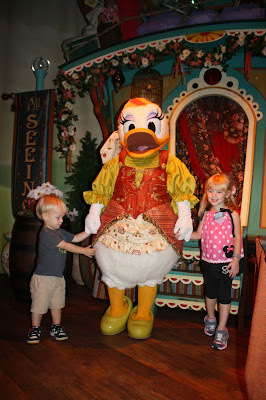 After reuniting with the others we decided to get in the line to meet Minnie and Daisy. Seeing Minnie was one of the things Sarah really wanted to do and while again, I'm kind of a traditionalist so I'd rather see Minnie in her polk-a-dot dress, the My Disney Experience App said the big top was the only place she'd be that day. Cody just wanted to pet her. I guess her feathers must be really soft. He seriously wouldn't stop. 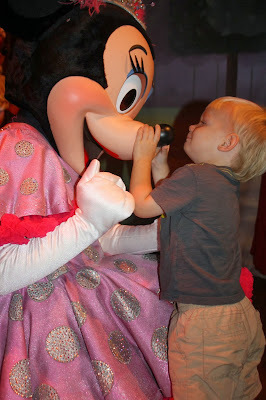 Then it was almost time to meet Minnie. 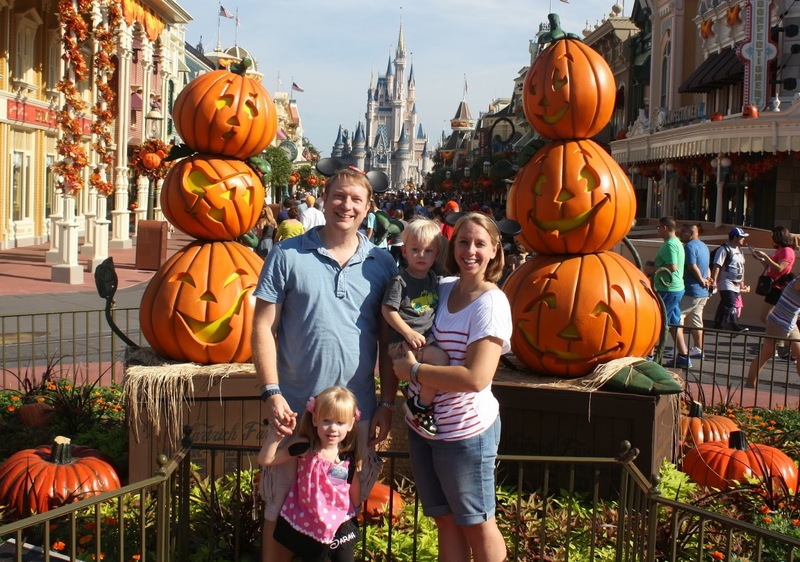 One family in front of us, and I'm wrestling with sippy cups, the camera, and trying to get the photopass card out. I didn't communicate very well with Chris about what I needed at this point and Cody was finally able to escape and make all his photobombing dreams come true as he ran into the other family's group picture. Whoops! 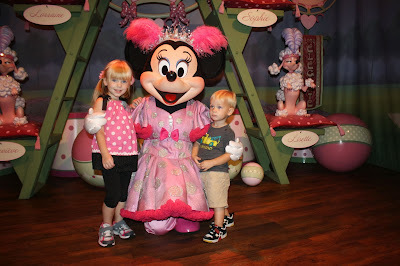 To make it even funnier the handler whom I had been chatting with about his desire was now with Minnie Mouse. After that incident Chris and I devised a plan and there were no other tense moments for us or escape attempts from Cody. Love how happy Sarah is in this picture. 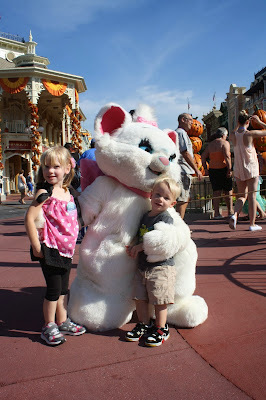 No idea what Minnie is supposed to be dressed as. Then we headed over to the new part of Fantasy land. Sarah wanted to meet Ariel. It had a bit of a line and Cody was losing it so Chris and him went to go get fast passes for the new Little Mermaid ride. 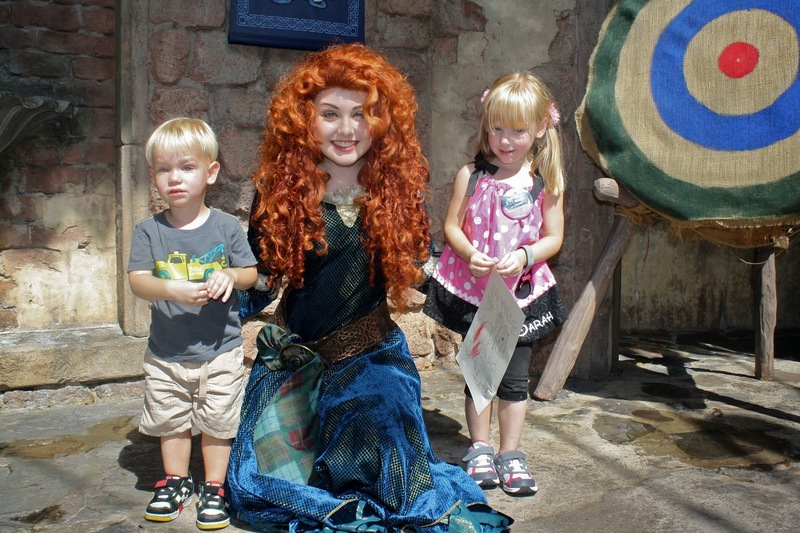 They made it back in time to meet Ariel but Cody wanted nothing to do with her. 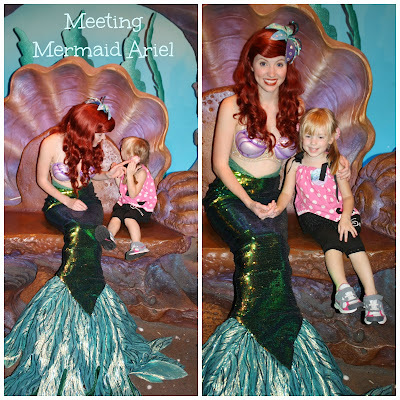 Sarah on the other hand loved meeting mermaid Ariel. She's only met her one other time and she was in her ball gown. Sarah was super excited. Ariel complimented her on her lovely sea flowers in her hair (picture on left). 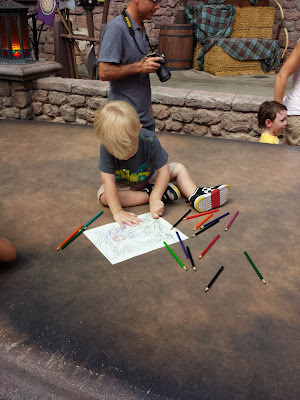 Then we rode the new Little Mermaid ride before Cody was done for and needed a lunch break.